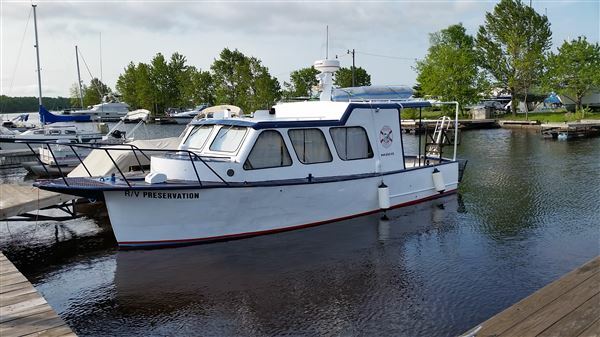 The GLSPS Research Vessel the "RV Preservation"
for the 2015 Diving Projects. If you have followed the TO DO list as to what we were planing to perform on the boat to make ready for the upcoming season, you would have noted items being checked-off each weekend. We feel good about what was accomplished by a few talented members. Launch weekend went quite well! We have a few minor details to finish. The weather for this Year's "Membership Appreciation Boat Cruise and BBQ"
was amazing. The "PRES" hit the water in the morning Sunday June 7, 2015. While a couple of us took it out for a short shake down cruise, the rest set up canopies and tables and set up for the BBQ. The food was great and the Sun made the cruise spectacular!!!!!!! Those who didn't attend, missed an awesome time on the water with the Duluth Harbor cruise and a trip out to the "WILSON"!!! It was the same date "June 7" as to when the WILSON sank in 1902. (113 years ago). We all gave her a solute and a tip of our hats. If you have any questions about the event, please contact Ken Knutson. His contact information is below. We hope to see some talented and new faces this year. See you on the "RV Preservation"
Now the RV Preservation is mostly complete (except for a few minor tasks) and is ready for the first project of the year. This year we had quite a list of tasks to complete including four huge tasks that took most of the weekends to complete. 1. Removed, rebuilt and reinstalled port transmission. 3. Port side Lasdrop dry seal coupler to totally rebuild and replace main seal and install back up seal. 4. Removed starboard side prop shaft to check for straightness. The prop shaft was OK the coupler was also rebuilt like the port side. 5. Lapped both props to shaft to make sure mating surfaces were in full contact with prop shafts and added new brass keys washers and cotter pins. 6. Rebuild Lasdrop dry seal water coupler and installed the main and backup seals. The above repairs took the lions share of the weekends. Please check the list on the event page to see what else we did to the vessel to make ready for the season. After a late launch and short shake down cruise by Ken Knutson, Tim Pranke and Dean Soderbeck, and the rebuilt transmission had it's final adjustments, Ken gave it the OK to give the Members a ride to the Duluth Harbor and back to Spirit Lake Marina. Thank you again to all that volunteered their time and support to prepare the RV Preservation for the season of diving projects. We all take pride in making sure the boat is maintained properly, be reliable and mainly comfortable for those that participate in the GLSPS Projects aboard the boat. 2. Tim Pranke (Helped all 6 weekends including the launch weekend). If it wasn't for the above volunteers taking their personal time to prepare the boat for the season, the boat would most likely still be in dry dock and wouldn't have launched on time for the 9th year in a row!!! Thank you all once again! !